It's time for the New Product Launch! All the Stamps, Die-namics, and Stencils can be found HERE. Please remember to visit each of the MFT Designers' July New Product Launch posts on the MFT Blog and leave a comment by the end of the day on Thursday, July 9 for your chance to WIN one of two, $100 Gift Vouchers. Ready? Set. Comment! I have two fun birthday cards to share with you today. The first one features the Decor & More - 5 Die-namics. These numbers are such a un item to work with. I die-cut one of my favourite plaids from the new Plaid Patterns Paper Pack. 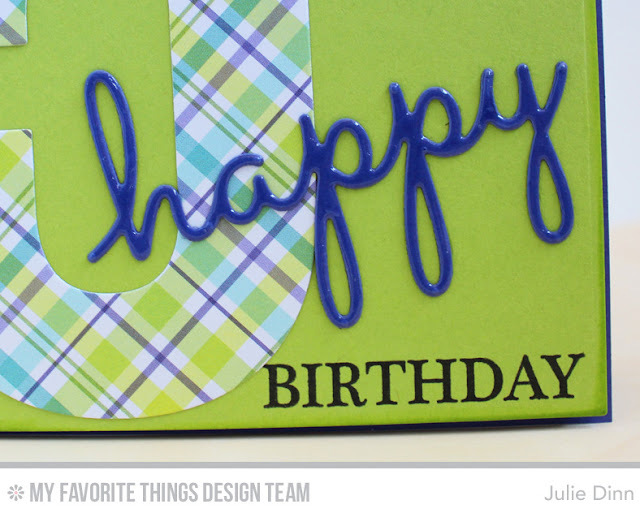 The happy word die comes from the fabulous new Blueprints 26 Die-namics. My second card features the new Birthday Centerpieces Die-namics and the Birthday Balloons Die-namics. The shaker was filled with a number of different Pretty Pink Posh Sequins. Be sure to check out the MFT Blog to see all the gorgeous creations our Design Team has to share with you. Nice cards! Especially the pink bday card! WOW!!! Great cards! So much inspiration! I love the metallic gold on the birthday card! Super cute! Wow love those shakers- they are so fun!! That plaid paper really makes a statement on your first card! Super cute, love the shaker! Fabulous designs! Love the new products! 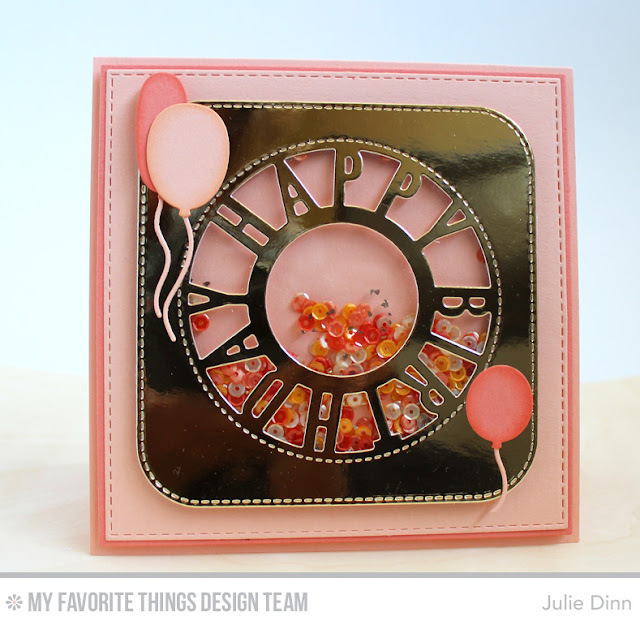 Love the birthday centerpieces die--great shaker card! The plaid number is fabulous! Wow, love these card designs! Love both cards, but especially the shaker card, awesome colors and design. LOVE --LOVE-- LOVE both of your cards. 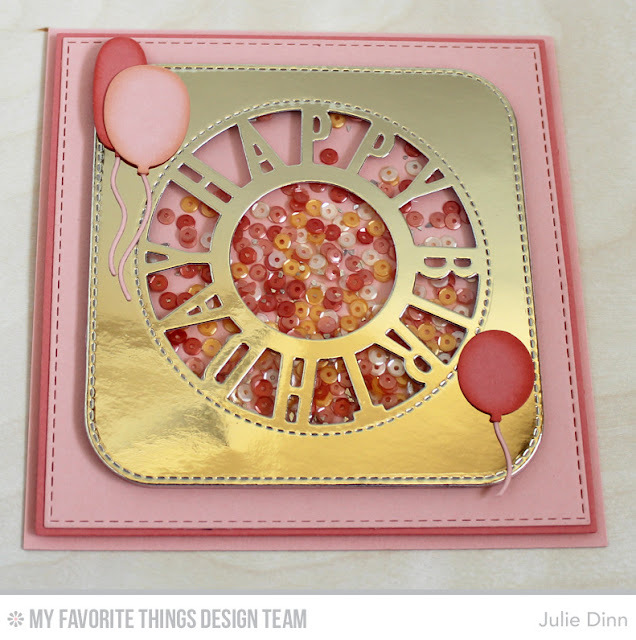 Plaid is Perfect, and I love the Birthday Centerpiece die in pink and Gold! Oh, wow…these both are so striking! The 'happy' looks like a purchased epoxy word sticker! And the gold shaker element turned out gorgeous on the second card! Ooooh, the pink and gold card is to die for! My favorite design so far. I like the plaid 5 and I like the pink and gold on the shaker card. luv your card designs and colors! Super cute cards. Love your color choices too. I've been eyeing those large numbers for cards for my (6 year old) grandson! Superb! Great cards love that big 5 and that gold with those balloons awesome, great idea. TFS. Love the plaid paper & great shaker card! Great cards, love the shaker card. That's one fancy shaker card! The Birthday Centerpieces card has the wow factor, lovely way to create a shaker card! Great cards. I love the shaker element on your 2nd card. I love bday cards with a big number--so personalized! and that shaker card is gorgeous! your second card is so beautiful, I love it! Great cards, love the ones with the shaker part on it. That shaker card is fabulous, love that die! Thanks for the fun release party this week. Absolutely Fabulous Cards! I love the Decor & More #'s. Perfect Size for what I need. Great cards! Love the large 5! Fun shaker card! Julie, your Happy Birthday shaker card is just amazing! I love the color combination and the wonderful design! So much fun! Love it!! What a fun shaker card! Beautiful cards! The second one is my favorite :-) Love the color. Such gorgeous creations! MFT has outdone themselves this time. Thanks for the inspiration! Love the plaid number and the shaker card is awesome. Well done. Love the bold 5 and the gorgeous diecut in gold. Love the yummy shaker card. Pink, gold and sequins??? Yes please! Oh my, that pink and gold card is divine! Love your shaker card - the foil really sets that card off! I must have some of the plaid paper!! Love both cards! Awesome, awesome cards!!! I agree that the large number dies are fun. Love what you did with the "happy" sentiment. Your shaker card is breath-taking. I don't know that I would have ever come up with the pink and gold color combo....looks sensational on your shaker card. I'll definitely keep it mind. Thanks for the inspiration. LOVE them both!!!! what cute plaid paper and that foil is fabulous too!!! Pink & gold- luv it! Gorgeous cards- your shaker is fabulous! A shaker and plaid - fun and pretty cards! This has been a fabulous release. Thanks for the chance to win. You always amaze me with your ability to come up with such great cards each month. I always look forward to seeing them. Your shaker card is very much fun looking and pretty and sparkly, and...and... You've done a terrific job. Oh these are so fabulous, I love them. These cards are so fun! Thanks for sharing them! 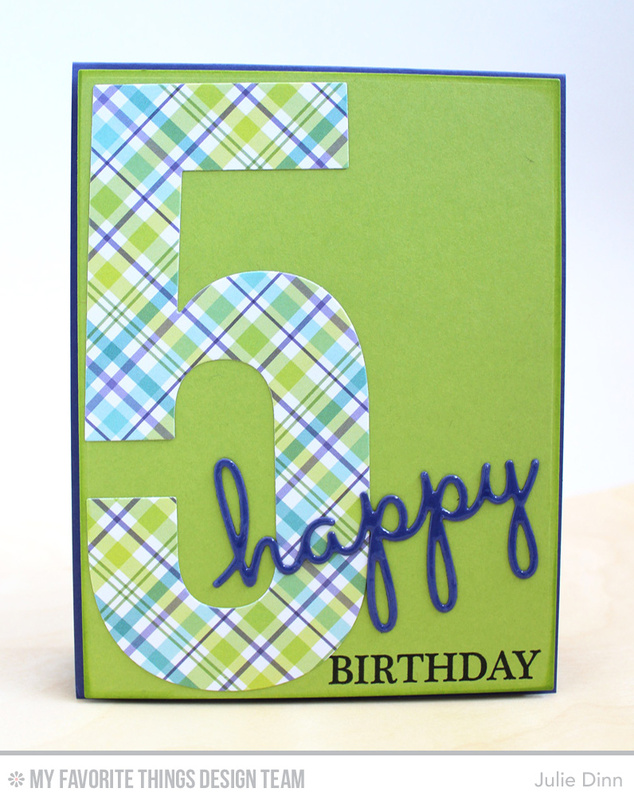 The "5" birthday card is so beautifully simple. I love your shaker. Great colour combo. The shaker card is one of my favorites yet! Love it!!! Super cute! Love the colors you used! Cute cards. Both of them. Love that die cut. So awesome. Wonderful cards! Great plaid paper and the gold on the shaker card really pops! Very pretty cards! Love that shiny gold paper and your amazing cards! That circle die is on my "must have" list. It makes a striking card. Love the gold. The first card is plain and simple but will be great for a child. I didn't realize the scale of the numbers! That's so fun! Love your cards!! What a great use of the number dies. Beautiful colors. Cool card with the giant number, great shaker card! I was trying to do without this die , but this sample clearly shows that I do need it. Your cards are adorable!! Love the shaker cards with the new die!! I love the shaker card, beautiful wok!! i love the shaker card, beautiful cards. Cute cards, love the colors used. 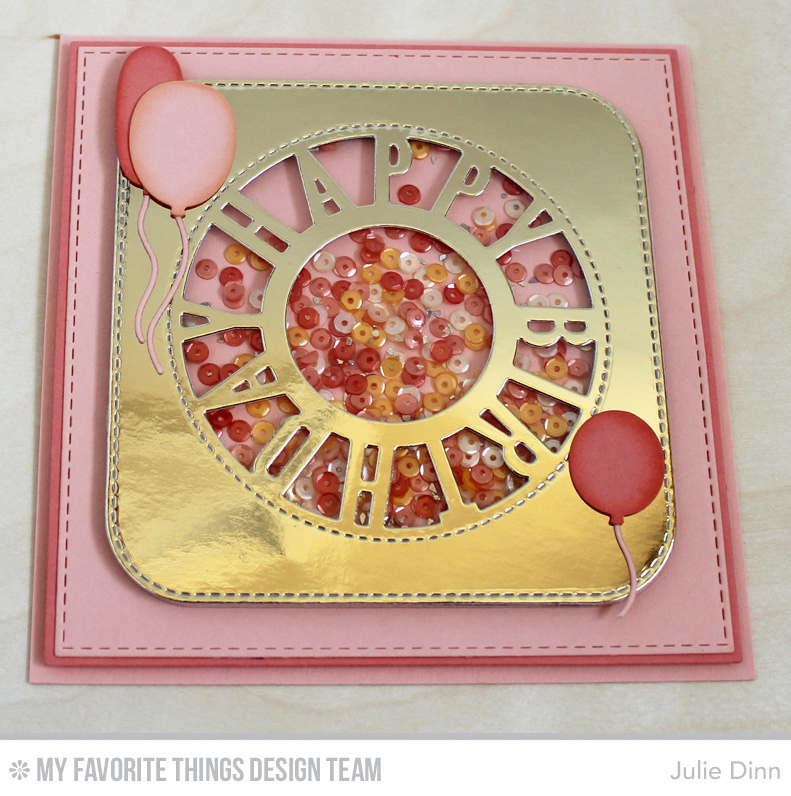 The gold foil cardstock and the Birthday Centerpieces die sure do make a pretty shaker card!! Love this new birthday centerpiece and it looks fabulous in gold! LOVE that shaker card! This new die is fabulous and looks awesome in the metallics.